I have ridden a Vespa for the past 12 years so when I spied this title in UBS Canterbury last week there was no way I could leave it in the bookshop! I guess I first became aware of the Vespa when I saw Audrey Hepburn and Gregory Peck whizzing about Rome on one in the movie Roman Holiday as a third former many many years ago. Then I recall one of my daughters going through a mod stage back in the late 80's and her boyfriend of the time used to come around and collect her on his Vespa. Today though my Vespa , a beautiful ET8 150cc coloured cream/pearl, is my pride and joy and I can be seen daily about the streets of Auckland as I go to the gym, clear the post office box, visit the supermarket or Bhana Brothers or Unity Books, or head off to Dizengoff or one of my other favourite coffee haunts. 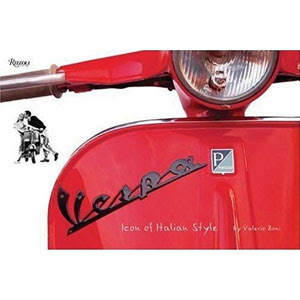 This compact hardcover book is a celebration of the Vespa's histroy and is filled with more than 200 colour images and it should be on every Vespa owwner's bookshelf. Fabulous.